As intake is generally lower than required, many people are classed as having magnesium inadequacy. This is not immediately severe, but as magnesium is required by so many processes, the effects can be widespread. Early signs of magnesium deficiency include loss of appetite, nausea, vomiting, fatigue, and weakness. As magnesium deficiency worsens, numbness, tingling, muscle contractions and cramps, seizures, personality changes, abnormal heart rhythms, and coronary spasms can occur. Severe magnesium deficiency can result in hypocalcemia or hypokalemia (low serum calcium or potassium levels, respectively) because mineral homeostasis is disrupted. Heavy drinking, amongst other things, can move inadequacy to deficiency. However, one factor that we can do little to change is the aging process. As we get older, we need more magnesium, but studies indicate we eat less. Requirements vary with age and gender. The Daily Value used in food labeling is 400 milligrams per day. This is easy to achieve using a few of the top selections from my list of foods high in magnesium. My high potassium foods list shows all components of the PRAL calculation, with data initially presented in potassium content order. You can click on headings (the nutrient name) for different sequences, and repeat clicking reverses the sort order. I list foods in serving sizes that provide 100 calories of energy. For pH balance, about 80% of what you eat should be alkaline. 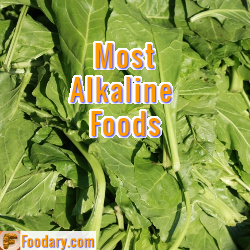 Alkaline-forming foods show as negative PRAL scores. You can click links in the table headings for more information. What’s your favorite magnesium food? As well as being important for general health, magnesium is an important contributor to alkaline diets. Supplementation is not healthy – you need to make good food choices from the list above. I can see that magnesium deficiency is a huge subject. So I will not review it in-depth until I can see sufficient Foodary readers are interested. However, I am interested in magnesium linked to Mediterranean Diet. Because I am planning to publish Mediterranean Eating plans soon. The proposed effect of Mediterranean diet against diabetes development was postulated to be an interplay between the pattern’s nutritional components. As it was observed, wholegrain cereals, legumes, and fruits consumption were primarily linked to the pattern’s anti-diabetic effect. Cereal-oriented dietary fiber has been suggested to act beneficially due to delayed gastric emptying, which slows down glucose absorption and reduces insulin levels, as well as the bran’s high magnesium concentration. Decreased intracellular enzymatic activity, due to magnesium deficiency, fosters insulin resistance. Legumes are also excellent magnesium sources. If you have any questions, experiences, or opinions about magnesium in your diet, please share your thoughts about magnesium foods.